Basel Backpack i Basel, Schweiz: Reservér nu! Up to 90 days to rental start 25%, 59 to 60 days to rental start 50%, 59 30 days to rental start 75%, later 100% of the rental rate. Basel Backpack - Urban Hostel Culture. Basels first Backpacker-Inn and Guesthouse with Bar-Cafe. 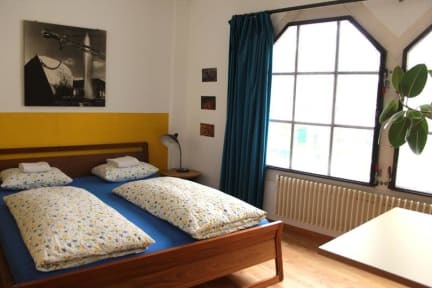 Inexpensive guest- and family rooms in middle of culture and leisure, 10 min from Basel SBB station. Basel mobility-ticket incl.! The Basel Backpack lies in the Gundeldinger Feld, a refurbished factory from 1826. Freshly renovated with warm colors, the BaselBackPack offers a cozy ambience in loft style. There are 85 beds in private double-, triple-, quad- and family-rooms and inexpensive beds in dorms, shared showers and toilets are next to the rooms. 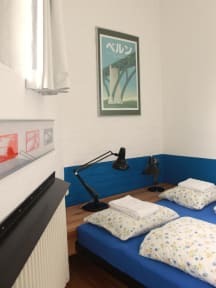 A self-catering kitchen, a lounge and hang-out with internet, vending machines, laundry and dryer, everything is handicapped accessible and operates according to the 2000-Watts-Society. The Gundeldinger Feld area offers restaurants, bistros, bars, playground, indoor climbing, pilates-studio, library, ateliers, theater, circus- and dancing schools, and houses various offices and services.